Striker Darren Lavery believes the overhaul in playing staff heading into the 2015/16 season has done the team ‘the world of good’ and says performances so far have meant there are reasons to be positive going forward. The 23 year-old is one of just seven players, excluding boss Colin Cameron, who remain from last season’s disappointing Scottish League Two campaign. And Lavery, who netted his 52nd goal for the club in last week’s superb extra-time League Cup win over Alloa, is pleased with how things have gone so far, although he admitted it was a bit of an unknown heading into the first pre-season training session. “Obviously the gaffer’s brought in a lot of new faces and it’s been quite a short period of time for everybody to get to know each other but so far, I’d say it seems to be working,” said Lavery after Saturday’s 2-1 win over Montrose. “The boys are gelling well together and there are some positive signs for sure. Lavery is sixth on the list of all-time scorers for the club. After starting as a substitute in the team’s first competitive game at St Mirren in the Challenge Cup, in the past two matches Lavery has partnered Blair Henderson up top in a 4-4-2 formation which has seen the pair score three goals between them. 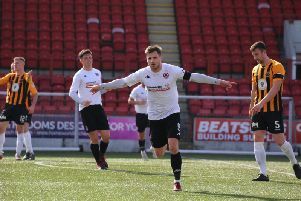 And after Henderson’s brace against Montrose, Lavery was full of praise for his team-mate and has warned other Scottish League Two clubs that there are goals galore in the Berwick front line this season.